Headquartered in Sydney, Australia, Goodman Group is an international integrated property management company. The company owns, develops and manages industrial and commercial business space across continental Europe, the United Kingdom, the Asia-Pacific region, Brazil and North America. Goodman employs over 1,000 people and services approximately 1,750 customers. As of June 2014, Goodman managed 430 properties in 16 countries, equating to AU$26.8 billion in total assets under management. Since 2009, the group’s business and IT strategies have focused on consolidating a wide range of systems and environments. “We’ve made a lot of investments in our infrastructure over the past few years so we can work closer together,” says Group Chief Information Officer, Luc LaFontan. Using Microsoft SharePoint to develop its knowledge management capabilities has been a cornerstone project for Goodman in recent years. Goodman wanted to improve employee communication and productivity by using SharePoint to deploy a content and collaboration platform with document and records management functionality. Once the platform was fully deployed, Goodman expected it to be the single source for all content and act as a repository for every document and record the business produces. SharePoint performs daily incremental search and indexing updates. The updates were failing every two weeks on average, forcing the business to run a full update that could take up to 60 hours to complete. This was largely due to an inefficient custom component to the original solution design. Furthermore, the volume of data fed into the system reached close to a terabyte in 12 months, straining Goodman’s limited storage and server resources and limiting its ability to use SharePoint enterprise search. Goodman investigated several options, including using a data center provider in the United States—a move that would require a considerable capital investment in servers, storage, and networking equipment. Eventually, it decided on a cloud environment. Goodman’s criteria for selecting a cloud provider included geographical coverage, maturity of service, stability, cost flexibility and ability to innovate. “Amazon Web Services (AWS) was the best option across all criteria,” says LaFontan. Goodman decided to move its website to AWS in the United States, in the US West (Northern California) Region, as a test to understand the capabilities of the platform. The website, which uses Microsoft SQL Server, the .NET framework and the Sitecore content management system, caters to customers globally across multiple countries by providing local language and property-catalog search capabilities. After the success of the web migration, Goodman developed a high-level solution design based on Microsoft SharePoint 2013. The company selected Microsoft SharePoint experts Ujelo Solutions, a Consulting Partner in the AWS Partner Network (APN) to help design, build, and deliver the system. “We have had a good long-term relationship with Ujelo; they helped us develop and architect our original Microsoft SharePoint 2010 environment,” says LaFontan. Goodman and Ujelo faced a range of challenges, including delivering a backup and recovery solution that complied with its risk management obligations. “We had to have conversations with our internal risk team and our external auditors about implementing Microsoft SharePoint 2013 on AWS,” says LaFontan. “This was a new architecture for the business and we had to adhere to strict change management requirements to meet our obligations to these stakeholders.” For example, Goodman has to be able to produce up to five years of historical content. Using a backup solution running within AWS, Goodman is able to fulfil this requirement on demand. This highly available infrastructure of AWS allows SharePoint 2013 to access high-performance compute power and storage on demand, enabling users to store, tag, find and collaborate on documents. Goodman’s solution uses DocAve Software to automate and manage SharePoint 2013 and to store archived content and backed-up data on Amazon Simple Storage Service (Amazon S3). Goodman’s knowledge management platform on the AWS Cloud services its Asia Pacific and Americas divisions, and the company plans to extend to Europe. “We have nine divisions and we expect to have everyone on the platform within two years,” says LaFontan. In the interim, Goodman continues to operate its legacy Microsoft SharePoint 2010 environment on physical infrastructure. AWS Direct Connect links the AWS Cloud with the Goodman corporate network using AWS Storage Gateway. Using AWS Direct Connect enables Goodman to deliver on its performance benchmark requirements, including a three second or less response time for sending small documents across the internal network. While the solution on AWS currently has about 400 users across Australia, New Zealand, the United Kingdom and Central Europe, all Goodman offices around the world can still access it, even if their documents have not yet migrated to the AWS Cloud. Figure 1 shows Goodman’s knowledge management platform using Microsoft SharePoint 2013 on AWS. Goodman and Ujelo completed the bulk of the project in two months, and the Australian division went live in late January 2014. “We were extremely impressed with Ujelo and they’ve continued to provide invaluable support as we migrate data across to the new system,” says LaFontan. Goodman is using AWS Support, Business-level to troubleshoot the infrastructure, but is considering moving to Enterprise-level support as its Microsoft SharePoint 2013 environment matures. Goodman took advantage of AWS Support to contact the support team for help establishing the AWS Direct Connect primary link and to resolve issues involving Microsoft Windows authentication with SharePoint 2013. The website migration to the AWS platform was successful because Goodman reduced costs, improved scalability, and extended its redundancy and disaster recovery capabilities. Migrating to SharePoint 2013 on AWS eliminated performance issues for Goodman and enabled it to extend its search capabilities without infrastructure resources providing a bottleneck. In addition, AWS Direct Connect has enabled Goodman to deliver on its performance benchmark requirements, including a three second or less response time for sending small documents across its internal network. Since the migration, the volume of data managed by the system has grown from one terabyte to 1.3 terabytes without compromising performance, and is increasing at a rate of 60 to 80 gigabytes per month. Moving to AWS also helped Goodman avoid spending $400,000 for a new storage area network. Goodman plans to use the funds for operating expenditure instead. Goodman is now looking at its next steps, including moving its core infrastructure and all business applications into the cloud and exploring the business intelligence capabilities of AWS. “The AWS Cloud gives us the agility to scale up and down as we need to, and allows us to move easily into new markets,” says LaFontan. To learn more about how AWS can help your business application needs, visit our Business Applications on AWS details page: http://aws.amazon.com/business-applications/. 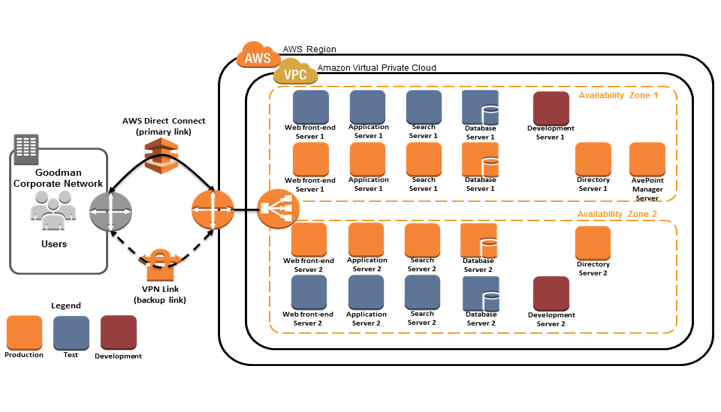 To learn more about partner solutions, visit our AWS Partner Network: https://aws.amazon.com/partners/.